Arnold Reda, 84, of Birch Tree Road, died Wednesday, November 21, 2018. He was the husband of the late Mary (McWilliams) Reda. They had been married 41 years. Born in Scranton, PA, on Sept. 16, 1934, the only child of the late Edna and Edward Reda, he had lived in Olyphant, PA, before moving to Foxboro 50 years ago. He graduated from Scranton Preparatory School and attended college with a scholarship. He was enlisted in the U.S. Air Force. Mr. Reda had been employed for 30 years as an electrical engineer at the former Foxboro Company. After he retired, he became a realtor. 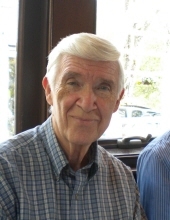 He was a longtime member of St. Mary’s Church in Foxboro. His hobbies included tennis, golf, and traveling. He enjoyed following all Boston sports teams and routing for the Foxboro High School teams, as well as spending time with his beloved grandchildren. He had the gift of gab and was well known throughout the Foxboro community. He is survived by two daughters, Michelle Cannata and partner Joseph Germaine of Foxboro and Marcia Behlmer of Attleboro; and two sons, David Reda and partner Mary Moseley of Encinitas, CA, and Paul Reda of Foxboro; and four grandchildren, Brian Behlmer of Attelboro, Kevin Behlmer of Medford, Louis Borges of Gilbert, AZ, and Stephanie Arteaga of Tempe, AZ. He has 4 great grandchildren. Relatives and friends are kindly invited to attend calling hours on Wednesday, November 28 from 4 to 7 PM at the Roberts and Sons Funeral Home, 30 South Street, Foxboro. A private graveside service will be held. For additional information please contact 508 543-5471. To send an on line condolence please visit the funeral home web site at www.robertsandsonsfuneralhome.com. "Email Address" would like to share the life celebration of Arnold E. Reda. Click on the "link" to go to share a favorite memory or leave a condolence message for the family.